Aside from the clearly tangible economics, there are various intangible benefits such as enhanced power stability, time and effort saved in permits, and efforts for land acquisition efforts and other statutory clearances. Some of these benefits can be quantified during the design stage or during the project operations. Solar-wind hybrid systems combine two of the fastest growing renewable energy technologies. Such a concept has emerged due to the complementary nature of solar and wind. Solar, due to its dependence on sunlight can produce power only during the day, probably from 8 am – 6 pm. The Wind, on the other hand, starts blowing during late evenings and reaches its peak during the nights. Due to this inherent nature of wind and solar, power production can be leveled out all throughout the day with a solar-wind hybrid. This means the reliability of the grid is improved by ensuring peak power requirements are met. How do solar-wind hybrid systems work? The hybrid solar wind turbine generator uses solar panels that collect light and convert it to energy along with wind turbines that collect energy from the wind. 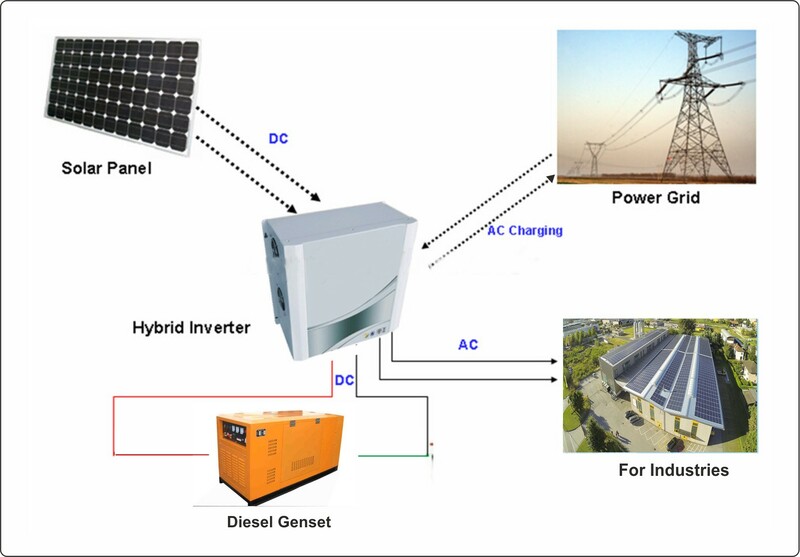 Solar wind composite power inverter has inputs for both sources, instead of having to use two inverters and it contains the required AC to DC transformer to supply charge to batteries from AC generators. Hence the power from the solar panels and the wind turbine is filtered and stored in the battery bank. For the times when neither the wind nor the solar system is producing, most hybrid systems provide power through batteries and/or an engine generator powered by conventional fuels, such as diesel. If the batteries run low, the engine generator can provide power and recharge the batteries. Adding an engine generator makes the system more complex, but modern electronic controllers can operate these systems automatically. An engine generator can also reduce the size of the other components needed for the system. Comparing the work involved in the construction of both kinds of power plants, it can be observed that there are synergies in the electrical, civil infrastructure and the permits aspects. Vast tracts of land often lie unutilized within a wind farm. A standard Indian wind farm usually occupies a minimum of 2-3 acres per MW. For various reasons, even though the land is not expensive in India (Rs 4-5 lakh/acre) it makes economic sense to open wind farm land up for solar development. Apart from the clear benefits of more energy per unit area, it also clubs together the costs, both tangible and otherwise, of acquisition, paperwork, clearances and support of local community. Gaining the support of the local panchayat and the labor force greatly alleviates project and construction risks, key concerns with the developer and financial community. 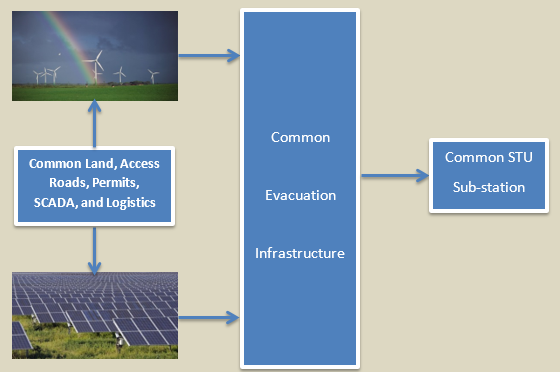 Since utility-scale wind and solar power plants are usually situated in remote areas, it is often necessary to build access roads to the specific site. This involves a considerable, fixed capital outlay which will be minimized over the higher annual generation of the combined plant. There will be synergies in cost for land leveling, building roads, construction of control and security rooms etc. Therefore, these will all be common to both and there is a direct cost saving. All of these put together are expected to save 2-2.5% of the total project cost. There are also significant efforts required, both in terms of time and money, for obtaining all the permissions necessary to begin construction and also, the operation of the wind or solar power plant. For evacuation to the nearest sub-station, the following are required: step-up transformers, electrical lines, and a DP yard. 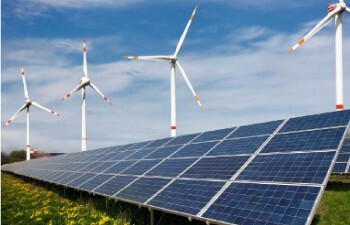 To a large extent, the electrical infrastructure can be shared between solar and wind power plants. The electrical evacuation infrastructure for a 1 MW solar plant usually amount to about Rs 50-60 lakh and is about the same for wind. It emerged, after consultation with experts that about the system can be designed for 0.6-0.7 times the total peak capacity saving about Rs 30 lakhs/MW of wind-solar hybrid. Usually being in desolate areas, communication and control channels need to be set up for remote interaction and control between owners and the equipment directly. Since there is nothing specific to wind or solar here except perhaps the weather monitoring stations (which work on different technologies), this can be regarded as common infrastructure and therefore, a direct synergy. In terms of costs, these individually account for 2.5% of a solar project’s cost. Firefighting and safety equipment are also common safety infrastructure for both and hence can be used by both parties. Even though both power plants use different kinds of electrical equipment such as connectors, fuses, cables etc., usually the vendors who make them offer different products. There is considerable scope for procurement synergies at large volumes. Operations and maintenance is an extremely important aspect of both wind and solar plants whose performance improves considerably upon regular service. Since O&M services for wind energy are, according to experts, less complicated than solar and much of the O&M engineer’s on-site work is towards preventive maintenance, common maintenance and service personnel can be utilized helping shave 1.5-2% of the combined O&M cost if they were running individually. A significant challenge that renewable power technologies (especially wind and solar) pose is that they are intermittent sources of energy and are greatly volatile, making the job of a grid manager extremely difficult. Indeed, Germany, which has one of the highest percentages of renewable power in the overall electricity mix, is facing such issues. Despite the challenges faced for implementation of solar-wind hybrid systems, there is no indication of such projects being technically or operationally infeasible. The independent systems cannot provide a continuous source of energy, as they are seasonal depending on the region. 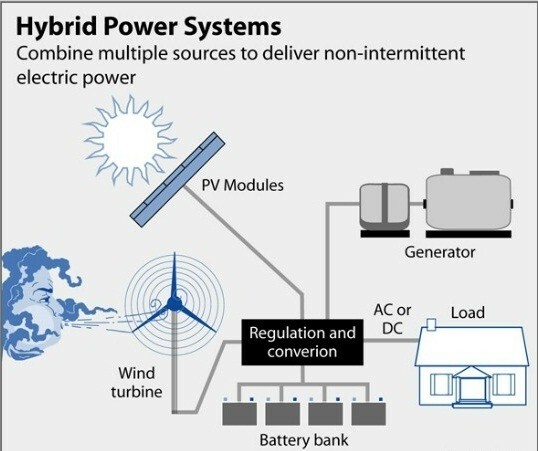 One can utilize a hybrid system of wind and solar to capture the strengths of each system, while at the same time overcoming the weaknesses of each system, to create a balanced approach to producing energy. The unit cost of power can be minimized but the same cannot be guaranteed for all regions due to the variation of the solar/wind energy received. In India, major Indian wind companies like Gamesa, Inox wind and Suzlon are shifting part of their focus to solar-wind hybrids due to the range of benefits they bring with it. The power procured from solar-wind hybrids can get even cheaper than isolated solar or wind power plants. According to Solar Mango, energy-intensive factories and industries with high electricity bills should look out for solar-wind hybrid solutions and explore the prospects of developing such projects for securing their power consumption. Are solar panels on greenhouses a good idea? 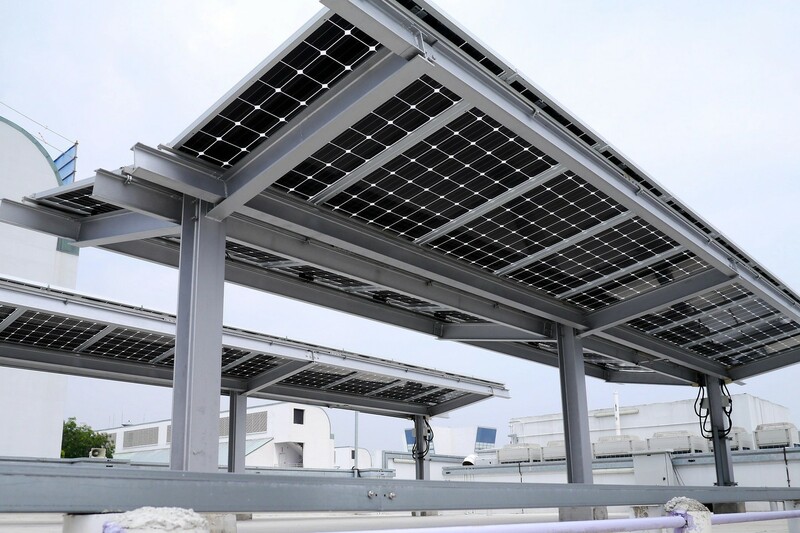 Why are rooftop customers keen on putting up solar panels over elevated structures? 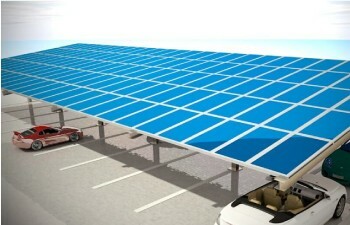 How Beneficial are Solar Panels Over Parking lots?